In the 14th Match of Group B Women’s T20, underrated New Zealand will face devastated Pakistan at Guyana, West Indies. Pakistan, who had previously lost to India and Australia, is still trying to make a footmark in the league. Although Pakistan Women gave a close fight to India and manage to surpass Ireland, raising hopes to get a ticket to semi-finals. But when it comes to facing some powerhouses, they face defeat, be it against Australia. The most significant flaw with Pakistan is that they are not able to deliver a hard-to-chase target and they lack the pace to achieve the target. Indeed Pakistan has played to the expectation. Nothing more, nothing less. While New Zealand is much in the same position as that of Pakistan at the moment. New Zealand started the match poorly against Australia. They manage to get their first wicket when Australia registered into a scoreboard of 70 runs in 8 overs. New Zealand’s bowling did improve hereafter and they did pretty well to keep Australia to a score of 153. Unfortunately, New Zealand’s batting had a broke back after their top 4 were out in the first three overs and there was the end of the run chase. The Face-off between the teams who possess the same quality would be exciting and definitely, a winning from either end will help boost the confidence. 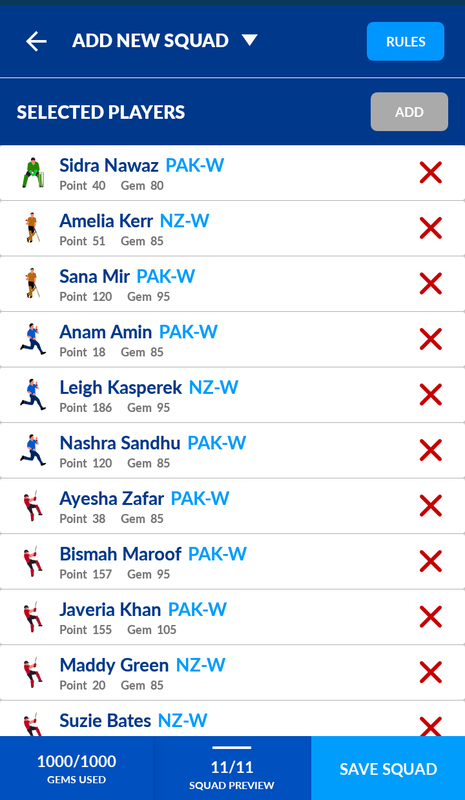 Sidra Nawaz (WK); Javeria Khan, Bismah Maroof, Omaima Sohail, Ayesha Zafar, Nahida Khan (Batswomen); Nida Dar, Sana Mir, Aliya Riaz (All-rounder); Aiman Anwer, Nashra Sandhu (Bowlers). Katey Martin (WK); Maddy Green, Bernadine Bezuidenhout, Suzie Bates, Amy Satterthwaite (Batswomen); Sophie Devine, Anna Peterson (All-rounders); Lea Tahuhu, Leigh Kasperek, Hannah Rowe, Amelia Kerr (Bowlers). New Zealand has disappointed in the WorldT20 so far but it has yet to play against any of the weaker opponents. Their caliber of players is undoubtedly superior to Pakistan’s even though the form may not be very encouraging.